Looking for the best LARGE gel cold pack? Then Look No Further! DESIGN: Crafted from durable nylon and vinyl fabric and filled with non-toxic gel. These gel cold packs are soft to the touch but durable enough to be used dozens of times. VERSATILE: Great for use on nearly any body part, including: shoulder, upper / lower back, knee, elbow, cervical, wrist, head, eye, perineal, ankle and foot. Helps soothe common aches and pains or injuries. SUPERIOR PAIN RELIEF & THERAPY: Delivers up to 30 minutes of soothing cool relief. Provides instant pain relief, long term therapy and helps to manage swelling. FREE FABRIC STORAGE BAG: The 2-pack of gel cold packs comes in a handy drawstring fabric storage bag. This bonus storage bag is our gift to you! TRUSTED: Cold Packs are recommended the most by Physical Therapists, Doctors, Sports Trainers and Chiropractors. Manufactured and sold by a FDA registered US company. Purchasing a Thrive Brand gel cold pack ensures a safe, sterile and regulated healthcare product. SATISFACTION GUARANTEE: If for any reason you're not 100% satisfied, simply contact us for a hassle-free full refund. We are a US company that has been in business for nearly 40 years and we truly believe in and stand behind our products! DESIGN - Crafted from durable nylon and vinyl fabric and filled with non-toxic gel. 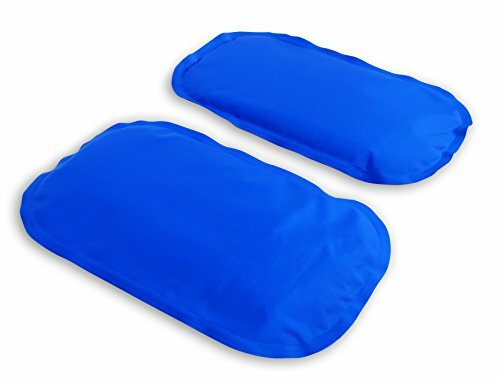 These gel cold compress ice packs are soft to the touch but durable enough to be used dozens of times. The packs gently provides soothing cold therapy and stay pliable during treatment. Won't turn into an immovable hard brick like most standard ice packs. These gel cold pack each are 11.5 inches long X 7 inches wide and less than 1 inch think. Each weighs approximately 0.5 lbs. You will receive two! VERSATILE - Great for use on nearly any body part, including: shoulder, upper / lower back, knee, elbow, cervical, wrist, rotator cuff, head, eye, perineal, ankle and foot. Useful for common conditions, including: wisdom teeth surgery, torn ACL / MCL, broken bone, fever, bruise, sprain, strain, hernia, plantar fasciitis, tendinitis and shin splints. Useful for a variety of sports athletes, including: football, soccer, running, gymnastics, swimming, golf, tennis, baseball and basketball. PAIN RELIEF & THERAPY - Delivers up to 30 minutes of soothing cool relief for aches and pains between refreezing. Simply place the pack in the freezer between uses and it will be ready to use again in 20-30 minutes. Apply immediately after an injury to control swelling and inflammation of soft tissue. Provides instant pain relief, long term therapy and helps to manage muscle and joint swelling. FREE FABRIC STORAGE BAG - The 2-pack of LARGE gel cold packs comes in a handy fabric storage bag. Made from durable polyester and featuring a drawstring closure. Store the cold packs in the freezer with this bag or use it for travel. This bonus storage bag is our gift to you! TRUSTED - Cold Packs are recommended the most by Physical Therapists, Doctors, Sports Trainers and Chiropractors. Manufactured in a modern sterile FDA registered facility and sold by FDA registered US company that has been doing business for 40 years. Purchasing a Thrive Brand gel cold pack ensures a safe, sterile and regulated product. Every Thrive Brand product is backed by a no questions asked one-year warranty. If you have any questions about this product by Thrive, contact us by completing and submitting the form below. If you are looking for a specif part number, please include it with your message.